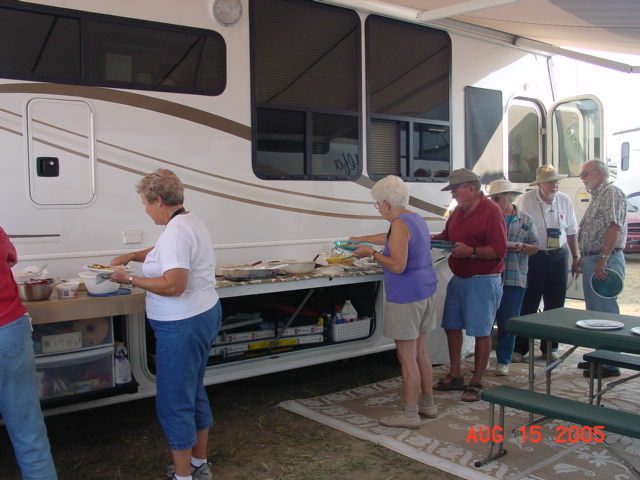 A chapter of Family Motor Coach Association. (FMCA) We are also grouped with the International Area (INTO) of FMCA. The AlfaSeeYas is a chapter of the FMCA, Chartered on May 19, 2003 at Sevierville, TN at the annual Alfa Owners Rally with 44 charter members. We have over 500 members nationwide. In addition to quarterly newsletter (AlfaSeeYas Connection) which is oriented towards Alfa motorhome maintenance and repair suggestions, we hold many rallies around the country throughout the year. Annual dues are $10.00 per coach with a first year application fee of $10.00. You will need to join FMCA first but the AlfaSeeYas will be glad to process the paperwork at the same time they process your AlfaSeeYas application. Want to catch a glimpse of where we have been? What events we have participated in? Click on this photo and then on any of the dates identified in the table. You will see AlfaSeeYa members enjoying themselves and getting together with others. If YOU have photos you want to share, please contact the webmaster or any of the officers listed above. What will help the most is if you also identify the date(s), place(s) and people found in your photo(s). See someone or some place NOT identified, feel free to share your information and we will get names, dates and places out there for others. Disclaimer: Through this website you are able to link to other websites which are not under the control of The AlfaSeeYas webmaster nor chapter members. We have no control over the nature, content and availability of those sites. The inclusion of any links on this website does not necessarily imply a recommendation nor do we endorse the views expressed within them. Weblinks are provided as a general information resource for the use of visitors to the website. The website administrator has not evaluated the suitability of the information provided via these linked-to websites, and inclusion of these links does not constitute endorsement of any organization. The links provided are maintained by their respective organization or submitters and are solely responsible for their content.